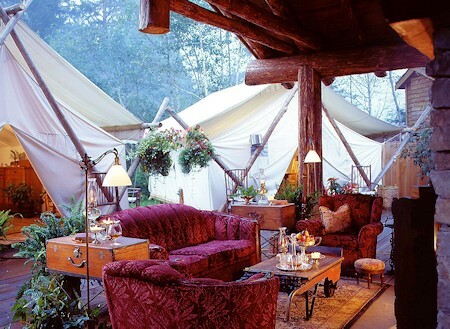 Clayoquot Wilderness Resort, Tofino, Vancouver Island, BC, Canada. 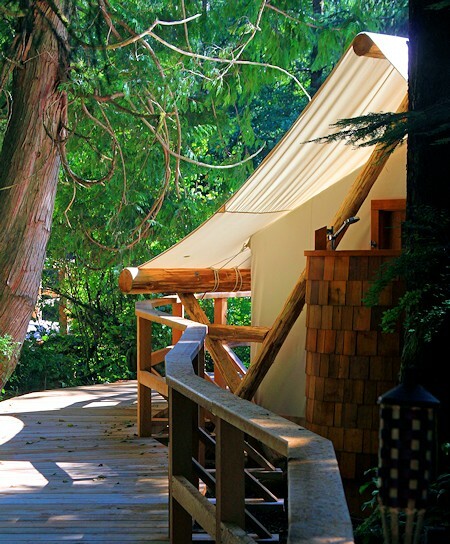 Luxury Lodging, Wilderness Eco-Resort at Tofino, British Columbia. 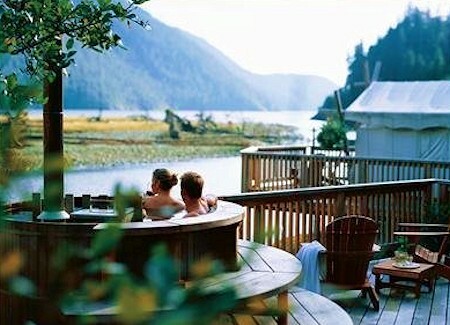 Clayoquot Wilderness Resort & Spa. 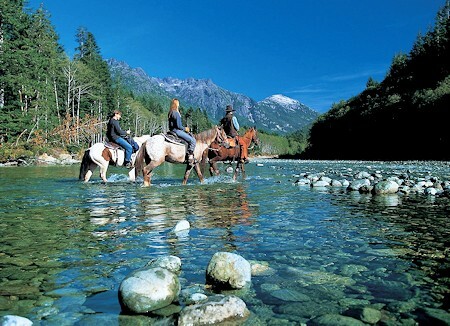 Luxury Accommodation, 5 Star Dining & Wilderness Adventures, Tofino, Vancouver Island, BC, Canada. Clayoquot Wilderness Resort promises discriminating travelers a world- renowned ultra-luxurious eco-resort, four-star accommodation, otherworldly coastal cuisine, super natural adventure, and some of the most breathtakingly beautiful wilderness frontier left on the planet. 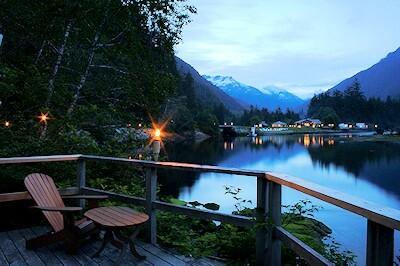 Clayoquot Wilderness Resort, just 40 minutes by boat or as the eagle flies from the quaint surfing village of Tofino BC, promises you both indulgent luxury and remote, untamed BC wilderness. This is the quintessential marriage of soft adventure and soft beds - of childhood wishes and grown-up dreams come true. 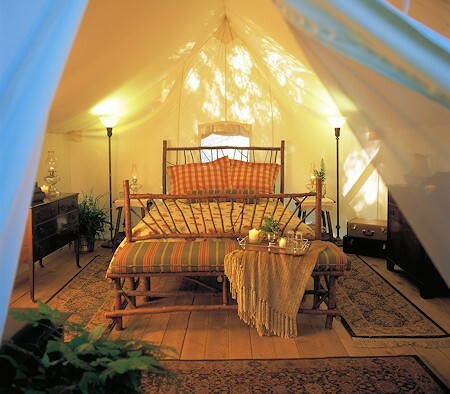 An enclave of great white canvas guest tents, plus dining, spa, and lounge tents, steamy cedar hot tubs, meditation decks and secluded outdoor massage platforms offers visitors a taste of how the fortunate spent their summers 'roughing it' some one hundred years ago. No matter how remote the Clayoquot Wilderness Resort may first appear, this is an ultra-luxurious, 21st-century-eco-safari style wilderness playground. Clayoquot Sound is rich in natural and aboriginal history ... and our guided activities include horseback riding, whale and bear watching, salt and fresh water fishing, kayaking, canoeing, mountain biking, Hot Springs Cove day treks, and naturalist hikes. You can also head out on your own equipped with state-of-the-art gear and expert instruction. Explore and find adventure in and around the camp as you go kayaking, canoeing, mountain biking, hiking, fishing, and wildlife viewing. Clayoquot Sound is world famous for more than big trees - there's big feisty fish here too. From May through September is BC salmon time - find Coho (silver salmon) and sea bass. In the heat of the summer, giant Tyee (king salmon) reign supreme, and deep sea halibut are prolific from March through September. Fresh water fishing is also spectacular and the scenery alone is worth the trip. The Clayoquot river systems percolate with winter and spring steelhead and sea-run cutthroat trout. Prime fly and spinning seasons vary with spring hatches and water levels. near Tofino and Clayoquot Sound on Vancouver Island, British Columbia, Canada. A wilderness so lush and exotic, so dense with visible wildlife that National Geographic magazine deemed it an upside-down rainforest (Feb, 2002). Five-star food and beverage service, world-class amenities, sumptuous interiors, and super natural adventure, leave nothing wanting, no detail undone. calls the resort "rusticating luxury". We call it home, and we know you will too.